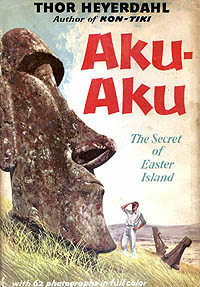 "Aku-Aku" was Thor Heyerdahl's big follow-up to "Kon-Tiki"--a book that helped cement the tiki culture in the minds of all bachelors in the western world. 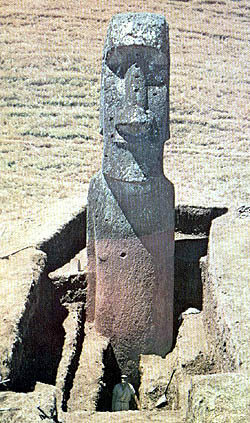 Instead of sailing the pacific on an ancient raft, Heyerdahl this time around uses a commercial steamer to travel with a crew of archeologists to mythical Easter Island. 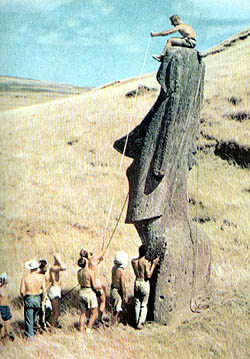 Not only do they take time to dig around the Moai's (the big heads) but they also nudge and coerce the natives into showing them how these statues were supposedly carved, moved, and erected. 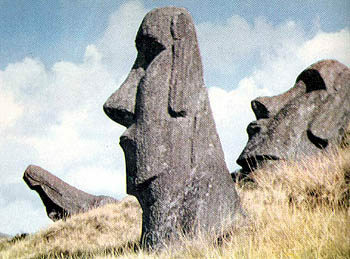 (Some later theorists argue that these statues were not put in place my human hands, but instead were the work of our UFO friends--but that's a story for another day.) Even though Western Civilization had changed the mind-set of the natives, they still, according to Heyerdahl, remain a very superstitious bunch. 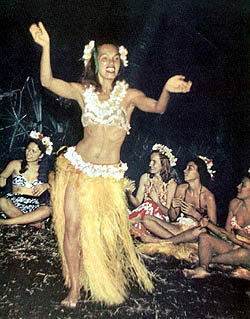 The book's title "Aku-Aku" refers to the spiritual guardian that people and families are said to possess. Even Heyerdahl himeslf gets into the "aku-aku" action. 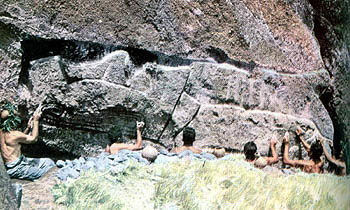 He plays off his "aku-aku" to cajole the islanders into showing him secret family caves and the ancient sculptures that lie in them. 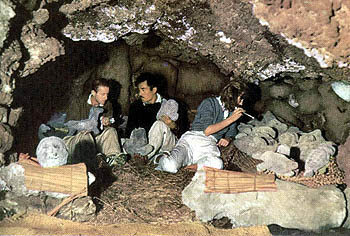 Some show him the real deal with others try to con Heyerdahl with fake caves and artifacts. 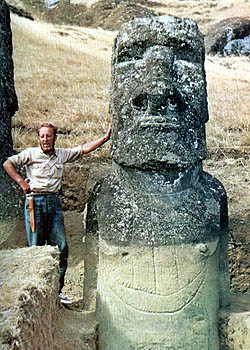 In the end, Heyerdahl comes away with crates full of these authentic ancient scupltures and the fear and respect of the natives. The scientific theories that Heyerdahl concludes the book with are framed in a dialogue between him and his supposed "aku-aku." The real fun of "Aku-Aku" is that it is part travelogue, part adventure story, and part detective novel. It was written for the lay person who is not interested the cold, hard scientific facts. It captures the spirit of the exotic South Seas with a real sense of flair and bravado. It is because of books like this that Tiki Lounges (such as this one) exist at all. Here are some great photos from the book.